Check out the casinos at the side of the review, see their welcome bonuses and make sure you deposit to get the welcome bonus that the casino. There is nothing better than enjoying the free time after a long working day with some slot games from the comfort of your home. 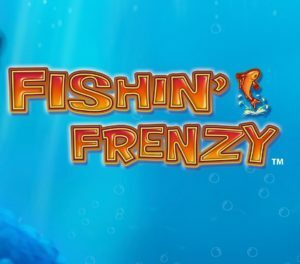 We are talking about Fishin Frenzy slot, the online slot game that’s developed by Blueprint Gaming and you can find it right here, on our site. The awesome online slot game is here to give you a way out of the hustle and bustle of the modern world with a fishing-related theme, so if you love fishing, there is no way you won’t love this game. The slot has five reels and 10 paylines at your disposal and you can start playing it as soon as you’ve selected a casino on the side of this review. The casino is pretty important for your gameplay, so use the welcome bonuses and our ratings to make your decision. You can even read the whole review to make a good choice. To start playing the game, you also need to set the denomination of the slot, which at Fisnih Frenzy ranges from £0.40 and it goes all the way up to £400.00. This will make the people who are here for the money and also the ones who are here for the fun and entertainment pretty happy. The maximum amount that you can win in the game is a coin multiplier of x2.000, so playing with as higher denomination as possible will do justice for you. The game can be played with a 96.12% RTP, which is higher than the online slots average. If the game already managed to grab your attention, follow the red button which says Play Now and immediately go for the spin, or you can keep on reading our full detailed review down below to explain the game even more. The online slot game is one of the calmest games that we’ve seen in a long time, and there is absolutely no surprise why a lot of people are already playing it and diving deep into the vastness of the ocean. As soon as you open the game, you will see a lot of blue in it, but there is no room for a surprise as we already know what the game is all about. The background is a deep ocean with cliffs on both of the sides representing the end of the screen. The top of the game is for the logo of the same, while the bottom is for the adjustable options and features of the game, like the Bet, coin value, level of the game and the Auto Play and Bet Max features. The magical spin button is on the right-hand side of the screen. Overall, the design is pretty awesome, and the blue colour will definitely make your day much calmer. Don’t forget to pop up the volume, as the sound effects are astonishing when a big win is about to hit the reels. As all the online slots games, there are two categories of symbols on the screen, the higher and the lower valued ones. The lower valued ones, as expected, are the standard deck of cars related symbols which start from the number 10 and go through the Jack, Queen and King all the way to the Ace. They have the fishing touch that everybody who is casting the line would enjoy. On the other hand, there are five theme-relates symbols and these include a heron, a fishing reel, a lifebuoy, a tackle box and some little blue fish with orange fins. Same with these symbols, the design of them is outstanding and related to the theme of fishing. To make things interesting, there are two special symbols in Fishin Frenzy Slot, and they will definitely enhance the game experience. Check out and hope for the Fisherman Wild Symbol which will substitute all the normal symbols which we just mentioned and participate in the winning combination of the same. This symbol can also create winning combinations on its own, which makes the game a lot more fun and exciting. Apart from the wild, there is also a Scatter symbol which is represented by a fishing boat which disappears into the sunset. This symbol activates the bonus feature of the slot game. To start playing this online slot game which possesses five reels and 10 paylines, you first need to select a casino where you will do that. The casinos are located on the side of this article, with the best one for this game positioned on the top position. The casinos play an important part of the gameplay, as you will spend most of your time on the pages of the casino. The casino will also be responsible for your deposits and withdrawals, so make a good choice. Check out the welcome bonus and the player’s rating to make your decision or simply choose the top one and you are good to go, as we only make deals with safe and secure casinos. 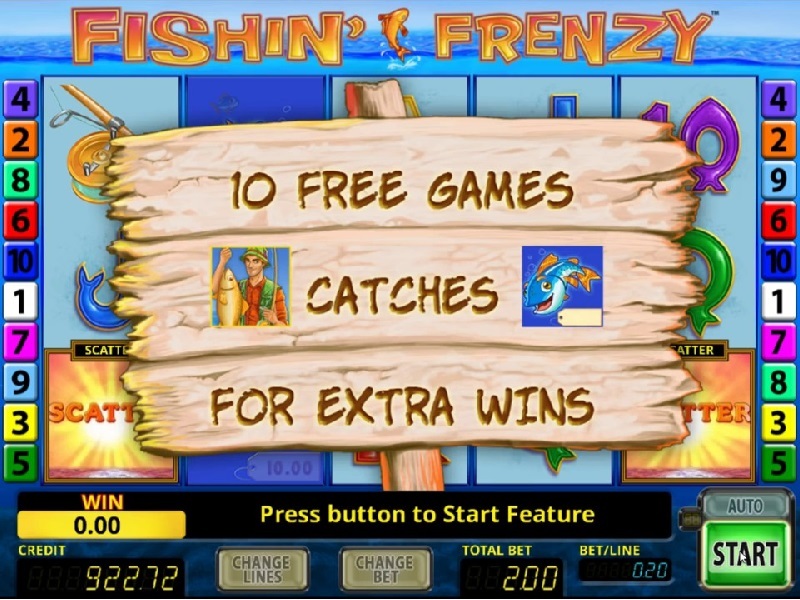 Once that’s done, it’s time to set the denomination of the slot game, which at Fishin Frenzy Slot ranges from £0.40 and it goes up to an amazing £400.00. The denomination will make all the people who are here for the money and the fun times pretty happy, but will also give satisfaction for the ones that are here for the fun and entertainment rather than the cash. One of the most amazing things that can be seen in the game is the Max Win which can be won in the same. It reaches a coin multiplier of x2.000 which is among the top rewarding games that we’ve reviewed. To Enhance the gaming experience, you can use the Bet Max and Auto Play features which are located at the bottom of the screen. The Auto Play feature sets the reels spinning automatically, with you only selecting the denomination and the number of auto spins that you want the feature to spin for you. You can go completely afk and make yourself your favourite cup of tea while the game spins the reels, or you can do completely what you want, even play another slot parallel to this one. Keep in mind that you can always cancel the feature and continue manually. On the other hand, you can also use the Bet Max feature. This feature sets the denomination, coin value and level of the game all the way to the maximum, while also activating all of the paylines that Fishin Frenzy slot has. This feature is one of the best and most challenging ones and can bring you a lot of money, but it can also lose all of your money in the blink of an eye, so you have to come up with a plan or a limit before playing this feature, or we suggest completely neglecting it. 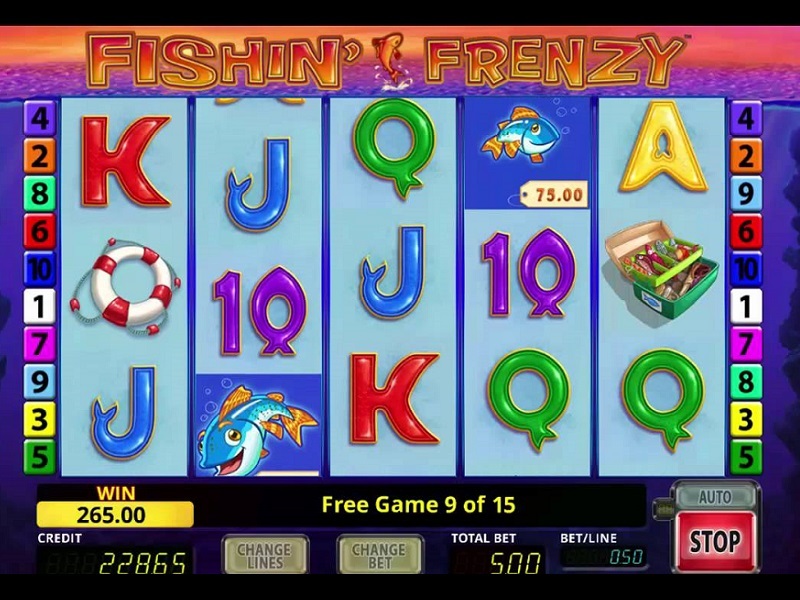 Let’s see the bonus features of Fishin Frenzy slot. This awesome online slot game developed by Blueprint Gaming offers only one bonus feature and it is the players’ favourite, Free Spins! Now, this is not a standard free spins bonus round, as you will immediately see how small fishes are jumping all around the screen. Eventually, the Fisherman will appear on the screen and if it happens at the same time as there is a fish on the screen, he will catch them and give you an award depending on the size of the fish that he’s caught. Unfortunately, there is not a possibility to re-trigger the feature and you will need to end it and trigger it all over again, which is not a big of a deal. We all know that the usage of mobile as a device is rising with a rapid tempo, the demand for all the casinos and games to adapt to this device has never been higher. This means that all the games should be responsive and playable on a mobile device one way or another. Fishin Frenzy slot, being one of the top games that you can find on the market, is responsive for mobile, and you can play this game from a laptop, PC, tablet, and now from mobile. Regardless of which operating system you have from Android, iOS or Windows, you can play the game from the palm of your hands. Depending on the casino you are playing at, you can either go directly through a browser or if the casino has an app, it may be a better option. The best thing is that Fishin Frenzy mobile is now available. The RTP plays a huge part in the gameplay and return of money. It is an abbreviation for Return to Player and it indicates the amount of money the player receives back from the game, over a long period of time. This long period is determined by the company who is producing the game, and it can be over a certain amount of spins (10,000 – 100,000) or a period of time (for example one year). If you want to find out more about the RTP check our Detailed RTP Guide. This percentage is higher than the average of online slots making the game desirable and playable. Check it out! Overall, the game is one of the calmest that we have reviewed for a long time. It has all that a person needs to relax, enjoy their after work tea and maybe grab some of their most valuable prizes. It offers an interesting gameplay and you would enjoy it the most as blue is your favourite colour. The x2,000 coin multiplier is one of the most interesting aspects of the game, together with the RTP of 96.12%.